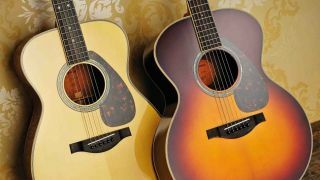 So, you want to buy an acoustic guitar? 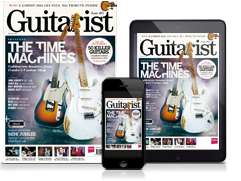 We've plucked the best mid-range guitars we've reviewed over recent years to show you the very best of what's out there below $/£1,000. There are a variety of body sizes on offer, from parlour to dreadnought, as well as tone woods, including spruce, sapele and mahogany. Each of these has a significant effect an acoustic's tone, so do your research before you take the plunge - the same goes for electro-acoustic preamps. In this price bracket, the vast majority of guitars feature solid tops, and all-solid builds are increasingly common. You'll find preamp and pickup systems onboard many of these models, too, making for quick and easy live performances and recordings. Aimed at newer guitarists, the 12e is not lacking Taylor’s spruce top hallmarks - bright and resonant trebles with assured projection. The low action is extremely welcoming across the ebony ’board, too, and will help open boundaries for aspiring players. Combined with the response of this instrument, it creates an immediately enjoyable playing experience. Plugged in, the ES-B represents the qualities of this guitar well and it sounds and feels superior acoustically and plugged in than most models we’ve played in their class, with the exception of Martin. The Academy Series represents a very clear vision, and in many ways, a dream beginner guitar, as well as potential trade-up for some existing players – one that can inspire and go the distance with a guitarist from bedroom to stage. Unlike Martin's own X Series, or indeed, the minimalist cool of Taylor's Big Baby, the Dread Junior might be downsized, but it's very grown-up in build, with all-solid wood construction, proper mortise and tenon neck joint, a bound top edge and simple soundhole rings. It might not have the huge depth or width, harmonically speaking, of the full-size dreadnought, but there's a punchy midrange and a slightly textured edge. It retains a Martin stamp: classic, old-school and a fine picker's choice, too. Put simply, it's a cracking guitar, far from a Guitar Shaped Object. For serious younger players, it's a great entry into Martin's heritage, but the more compact size means that many a more mature player will enjoy it, too – it's certainly one of the best small bodied acoustic guitars. The Paramount Standards offered serious spec for the money and here adds all-mahogany construction to the range. While we’re encountering more guitars in this price territory that aim for vintage Americana-style heritage, these models set a new standard for their price range. In many respects, the PM-1 is a textbook example of an all-mahogany dreadnought boasting a lot of the character that attracts players to this wood choice, but it feels notably livelier than some we’ve encountered. That mahogany mid voice is there in abundance with a thumpy and defined low-end, rather than the boom that we’d hope to find from mahogany. Fender’s latest addition proves it’s on the right track with the Paramount series. If you’re looking around the £500 end of the market, this is a must-try. Not everyone loves those bird inlays! What we have here is a sorted mid-priced electro-acoustic with great build quality and a pleasing tone straight off the peg. The important thing to note here is that you could say that about a fair few guitars out there – and all available at a similar price. What we need is the SE TX20E’s unique selling point. The easy answer is that classic PRS ‘Wide Fat’ neck profile. If you’re an SE electric fan then you already know this neck, and the switch from your solidbody to this electro-acoustic should be pretty much seamless. If, on the other hand, you’re new to the brand you might be surprised as to just how approachable that neck shape is. It secures this bird-decorated beauty a lofty perch in the affordable electro-acoustic pecking order. Originally introduced in 2001, Martin's Road Series was part of a serious attempt to make the kudos of owning a Martin more attainable. Costs were lowered due, in part, to production being moved to Martin's Mexican facility. Our review solid wood DRS1 showed absolutely no signs of any lapse in build quality or standard. Every joint is super tight, every line clean and crisp. There's not a trace of excess glue to be found anywhere and the satin finish is smooth and uniformly applied. When played, there's a boisterous, lively tone. With its snappy, tight bass the DRS1 pitches chords with depth and soul while a bright, clear top end adds sweetness to the timbre. The Fishman preamp sounds a little brittle when pushed, but in terms of sheer value for money, not least with that iconic name on the headstock, the DRS1 is going to take some beating. Cort's enormous South Korean factory is dedicated mainly to building instruments for other manufacturers, but the firm does have its own range. These, with their lack of brand identity, offer good value for the specs. This OM is an all solid guitar with a piezo pickup and a hard case for a very competitive street price. The intonation is perfect and it was delivered beautifully set up. It’s also remarkably light, which is a good sign for a factory-made model. Sound-wise it will likely surprise those that think they know what to expect from a mahogany guitar – it's significantly louder than many spruce topped OMs we’ve played and the treble is bright and sparkling. Well worth a try, particularly for those prizing spec over brand name. Simply put, Sigma's guitars will break your heart and not your bank account - music to our ears. With its grand jumbo body, gloss sunburst finish and golden hardware we’re not sure as whether to play it first or take it out to dinner. It sounds like it looks: colourful, bright and bursting with character, the SG200 creates a unique tone that sits perfectly within the body of the guitar and projects with gusto. Strummers will be in their element, while fingerstylists will enjoy the 44.5mm nut width. The Fishman Sonitone does a decent job of projecting the guitar's natural tone and, if you can live without an onboard tuner (and the just-over-the-$1,000 price tag), there's not much going against this model. Let’s address this up front; this guitar is not taking any prisoners, visually. If it were a pop star, it would be Vegas Elvis. The Penguin Parlour is a small-bodied acoustic with with the styling of a White Falcon applied, and the same approach has been taken to the Penguin Parlour. The solid spruce top is, like all the wood, hidden under a coat of solid white paint, while Gretsch has smuggled in a Fishman Isys pickup and preamp, giving you a tuner, volume, and three band EQ. A quick strum reveals a tone that’s much more resonant and full than you can normally expect from a small body. It’s a well balanced tone: the top end is bright, with a sparkling spruce tone, light and feathery. The mids are again airy and light, brightish, but more punchy than sparkling, while the bass is firm, with good projection; not big and booming, but not small or boxy at all. It is impressively feedback resistant, even at high volumes. For all its rhinestone cowboy looks, this guitar is no toy, it’s a real musician’s tool.